The Diablo Bogie wheel design are simple pivot mounted assemblies that rely on a rubber spring to support downward pressure on the track. Bogie wheels on the 500 are different than the bogie wheels on the 502/3 models. Lets start by talking how they are constructed. The first indication that you have bogie wheels for the 500 is the obvious spring clip instead of the weld to hold the wheel on the shaft. 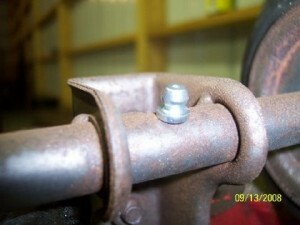 On the 500’s, the bogie pivot bolt is also held in place by a spring clip. This was changed on the 502/3 models and welds replaced the clips on the wheel and cotter pins replaced the clips on the pivot bolt. A less obvious difference between the two is the 500 bogie support has less of a curved support around the center “U” brace. On the 502/3 models, Bolens added material to the bend much like car doors have brakes or bends in the panels to stiffen them. The added support makes the later model bogies more durable. Note – ignore the grease fitting and zerk holes as niether original bogies came with grease zerks. Hey, that is cool to see one apart! I just wanted to add that the 500 bogies have thinner gauge steel than the 502/3 bogies. That last 500 I got had the bogies all broken. A combination of no rubber on the frame rail mountings, lighter steel and riding it hard. They did not last long! 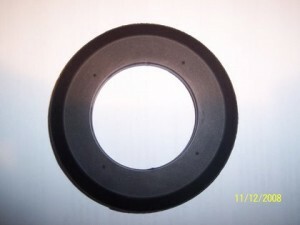 The last difference between the models is the location of the rubber spring mounting hole. The 500 bogie on the left has only one mounting hole and it put the rubber spring closest to the pivot pin. This location increased the “lift” of the bogie. With the redesign of the bogie rail on the 502/3 models, another hole was introduced into the bogie further away from the pivot which allowed the bogie to set more level and closer to the rail. Relating to leverage, this rubber spring now mounted further away from the pivot pin reduces the force applied to the pin and bogie assembly again making for a more reliable assembly. 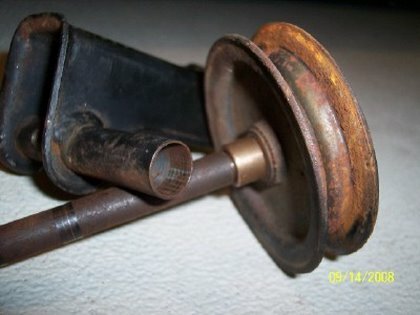 Note: You may find a rare bogie wheel station that has the spring clips (telling us it is a 500 bogie station), but double rubber spring holes and a thicker “U” brace. These are bogie stations from late in 67′ when Bolens was making upgrades from the 500 design to the 502/3 design. You tend to find these bogies on Diablo 500 with serial numbers around 15000 and above. In the 502/3 parts manuals, you might have noticed that the single bogies have two part numbers. The difference between the single bogies is where the rubber bumper is mounted. The single bogies closest to the idler sprockets should have the bumper installed in the closest hole to the bogie pivot which increases the pressure it puts down to the track. The rest of the single bogies have the bumper mounted in the hole away from the mount as described above. In addition to the 12 single bogie stations are 2 double bogie stations that are located directly after the drive sprocket. 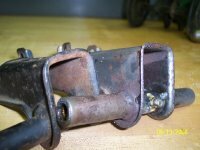 These double bogies are very open to damage from trail riding and are often found bent up or broken. - A 500 bogie wheel should only be used on a 500. If a 500 bogie is put on a 502/3, it will have too much “lift” and will not properly align the track. - A 502/3 bogie wheel can be used on all models. 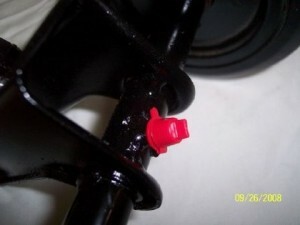 If used on a 500, install the rubber spring closest to the pivot pin. If on a 502/3, install the rubber spring away from the pivot pin except for the two bogies just prior to the Idler Sprockets. Mount those two rubber springs closest to the pin. With that said, if you are rebuilding a 500 and you want it as original as possible and plan not to drive it much, I’d suggest to use the original bogie. However, if you are restoring a 500 to drive, for durability, I’d suggest to get yourself some 502/3 bogies. It’s important to understand this difference in design of the bogie rail. The picture above is the mount from a 500. 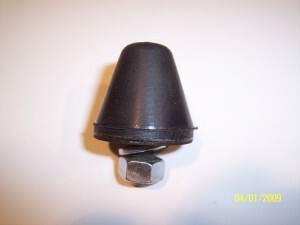 The mounts have metal inserts. 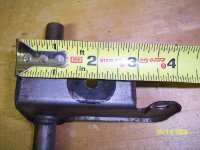 With the rail redesign on the 502/3 models, a rubber bushing was installed and a travel limit pin was welded to the mount to stop the bogie from flipping over. Without the limit pin, if you are jumping around on rough terrain and get the tractor up on the air, a bogie could flip around and get ripped off when the unit comes back down in the snow. A good reason to drive the 500 with care. If you go to reinstall your bogies into your 502/3 and find the rubber bushing worn out in the chassis, you can use a 3/8″ ID piece of rubber hose for a bushing. All bogies are designed with a bronze bushing on each end of the tube. 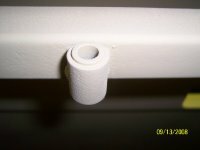 The tube end is machined out to accept the bushing and the shaft should turn in the bushing, not the bushing in the tube. The bushing above looks like it has a shoulder on it, but that is not true. The bushing has no shoulder and the washer is really part of the wheel. I sacrificed two bogies trying to press them apart and it was not possible. Unless someone has another suggestion, I think pulling an assembly apart is not an option. The reason I wanted to know how it was put together was to better understand what causes them to lock up and how to lubricate them. 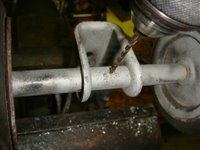 Now knowing that the bushing is on each end, that is the area that needs to be heated if you have a bogie with a frozen shaft. Heating the center will not help. 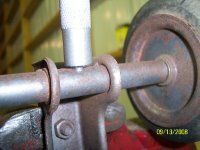 One other bushing note is that many of us add weld between the tube and mount to strengthen the connection. On single bogies, the bushings are far away from the weld so there is no concern about damaging the bushing. 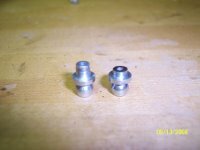 On the double bogies however, you can’t weld on the outer edges of the tube or the weld will blow through the steel and damage the bushing. 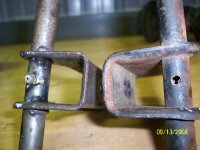 None of the original bogies supplied with the sleds had grease fittings on them. If you bought a new bogie, it may have come with a fitting as Bolens made this update on their replacement bogie assembly. Installing a lubrication fitting in the center of the shaft seems to be the best option for lubrication and this is how Bolens installed fittings too. Shown above is a pressed in fitting and once in place, needs to be brazed or welded onto the tubing. 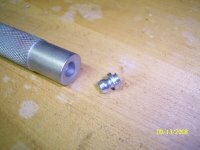 This is required because the tube is thin and because of that, the fitting will pull out easily. Bolens did not braze their fittings in place, but I recommend you do. I start out with a standard 3/16″ press in grease zerk and grind it down (picture on left) so it’s not deeper than the tube is thick. Then using a zerk punch, the zerk is compressed into the 3/16″ hole by tapping with a hammer. The punch is simple round stock steel with a hole drilled in the end to match the rim of the zerk. Easy to make. Punches are also available at McMaster. - Thicker grease will hydraulically push the bushing out against the wheel. When this happens, the wheels turn hard after greasing. To fix this, hit the shaft toward the center with a hammer to get the bushing back in place and this should free up the wheel. Be sure to support the bogie when you hit it. - Thicker grease will remain in the tube between the tube and the shaft. When the shaft turns, it will need to plow through the grease and the colder it gets, the harder the wheels turn. To oil the bogie bushings rather than grease, put oil in the grease gun instead of grease. This is after the grease fittings are installed. You can also use penetrating oil if needed. Any oil will tend to liquefy the old lube in the bogie if grease had been used before. A good quality grease gun will work as a hydraulic hand pump for small pressure jobs. Some will develop up to 5000 psi and more. Thanks Steve. I did buy a lube pump very similar to a grease gun but with better seals. Every time I pump oil into a bogie wheel and get that “free spinning” result, I’m convinced oil is better than grease. 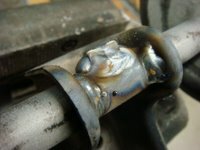 I drilled an 1/8″ hole through the tube facing forward and mig welded on a 1/4×28 nut to screw the 45 degree zerk into. You have to weld them good ’cause the pressure you use to force the grease in the first time is incredible with sometimes having to use the torch to heat the tube to allow the grease to flow to one side or another. 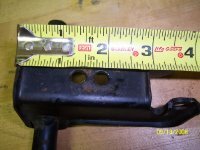 You also at that time should add a bit of weld to the tube-to-bracket seams ’cause they skimp on the weld and they tend to fracture there. These mods will extend the reliable cruising range of the sled far beyond the original design perimeters. Of course, if you go through all the work to put a zerk in your bogie wheel, you should go one step further and put a zerk dust cap on too. It not only keeps the water out of your bogie fitting, but they look cool too. We have zerks and zerk caps available. Often the rims under the bogie tires rust a bit or get dry and then the tire can be easily knocked off center. You would think you have a bad tire, but removing them, lubricating and reinstalling them allows the tires to seat down in the rims properly. The rubber on the bogies can be removed by prying them off with a couple of screwdrivers. Then clean up the inside of the rim and coat with a layer of grease. Then work the tire back on. When reconditioning bogie wheels, pull all the wheels off. 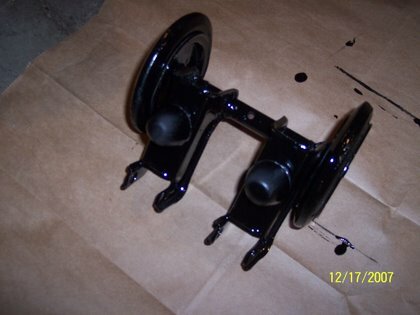 Clean, paint if necessary, and lubricate the hub. Then re-install the wheel. New tires are available. Lastly is a discussion about the rubber bumpers. Their purpose is to support and lift the bogie wheel and provide support of the track. Shown above is a new bumper. Unfortunately after driven for many years, your original bumpers won’t look this nice. They tend to get squashed down or delaminate from the mount. The bumpers on the double bogie wheels and the single bogie wheels prior to the idler sprocket have thick flat washers under them to provide additional lift. The additional lift helps the track come off the drive sprocket cleanly and on to the idler sprocket more easily. These flat washers would have only come with the 502/3 models.